A specter is haunting German Chancellor Merkel in the wake of the Berlin terror attack—her own junior partner in government, as well as the European far right, Putin’s Russia, and Islamist extremists. Yet the far right, which one expects to blindside Merkel given any plausible opportunity, wasn’t alone—nor was it the only one cheering. Just a hair’s breadth behind it was, one would presume, a much less likely antagonist: Horst Seehofer, leader of the Bavarian Christian Social Union, the sister party of Merkel’s Christian Democratic Union. The CSU runs on national slates together with the CDU and rules with it, too, such as in the Federal Republic’s current center-right government. The party has dominated politics in Bavaria since World War II. Even in the days of a divided Germany, the CSU functioned as an archconservative sparring partner of the CDU, at times critical of its big sister from the right, but in the end willing to fall into line. In contrast, Seehofer, with his party fully behind him, is unrelenting in his prosecution of Merkel, and he made no exception the morning after the carnage in Berlin. “We owe it to the victims, the aggrieved, and the entire population,” he said, “to rethink and readjust our immigration and security policies.” Clearly, in his mind the responsibility for the bloodshed lay not in Islamist fundamentalism, preposterous German security glitches, or political instability in the Middle East and North Africa, but rather in Angela Merkel’s flawed policies. Merkel has no greater or more damaging detractor in Germany—or even in Europe—than Horst Seehofer of the CSU. Seehofer is proving more than just a thorn in Merkel’s side—and his tormenting of her has already had Europe-wide ramifications, turning Merkel into the bête noire of the parties, politicos, and countries that insist on barricading their borders to keep refugees out. A slow-moving, bearlike man, the 67-year-old career politician barely opens his mouth when he speaks, grumbling curt sentences in a Bavarian dialect. Well-spoken or not, Merkel has no greater, more damaging, or more indefatigable detractor in all of Germany—or even in Europe. No one figure has done more to hurt Merkel on the issue of migration than Seehofer, who misses no opportunity to belittle her compromises in his direction (and there have been many) or scheme behind her back. He’s even invited Hungary’s autocratic, anti-refugee prime minster Viktor Orbàn to the CSU’s headquarters, and parlayed on his own with Russia’s Vladimir Putin in Moscow. Germany’s leftist opposition claims that the chancellor’s spate of compromises has effectively gutted the right to asylum. But they’re wrong. The Merkel government’s measures have indeed dramatically limited the numbers flowing into Germany: from up to a million last year to some 250,000 this year (about 40 percent of them in 2015 were from Syria). But Merkel, virtually alone among Europe’s current leaders, staunchly defends the principle of the right of persecuted persons to seek asylum in third countries. She refuses to wall up Germany’s borders or cap the number of refugees Germany will accept each year. Merkel represents Europe’s last line of defense against the right to asylum’s de facto annulment, which would constitute another ominous step in a shift under way to an illiberal Europe, one divided into ethnic nations, protected like a citadel, and led by autocrats, such as Orbàn and Putin. Seehofer’s motivation for hounding Merkel is part ideological, part short-sighted machtpolitik. Like many of Europe’s Christian politicos, religious authorities, and nationalists, he understands Germany, and all of Europe proper, as white and Christian—something Germans aren’t supposed to utter too openly, though the likes of the AfD do, as do Orbàn and others outside politically correct Germany. In Germany, these types of Blut und Boden conservatives have not had it easy during the 11-year reign of Merkel, herself a Protestant who has swung the CDU dramatically to the center, not least in terms of Germany’s understanding of itself as a country that is home to peoples of different religious belief and skin color. Merkel’s lurch to the left had left many old-school conservatives homeless until the AfD came along (though more than a few remain in her camp, simmering with resentment). Seehofer’s Merkel-bashing plays into the hands of several ignominious currents on the march in Europe today. In conservative Bavaria, Seehofer and company believed that they could close this gap with Islamophobia and jingoism. Yet there’s plenty of evidence that his AfD-lite has failed to do that, instead fanning the flames of the far right in Germany and elsewhere in Europe too, making the rightists respectable and delivering them copious fodder to pummel Merkel. Bavaria hasn’t voted since the AfD appeared, but polls show that if it did today, the far rightists would garner 10 percent of the vote, just a little less than the national average. 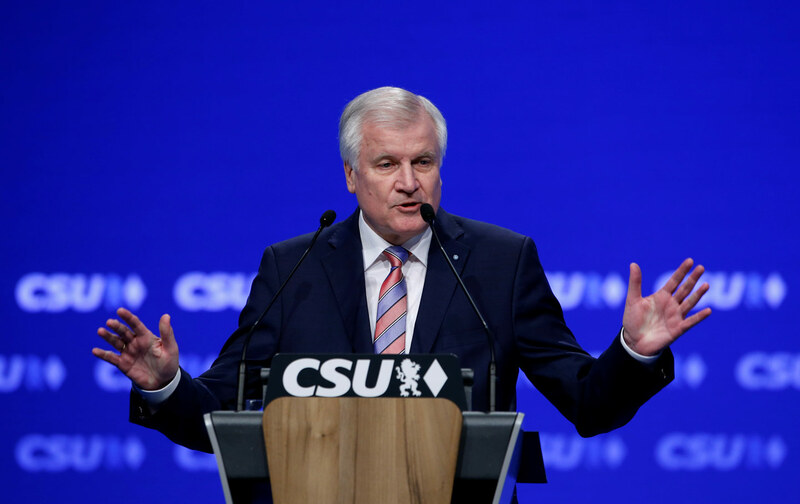 The CSU would win handily, as it always does in Bavaria, but not with a full-scale majority—and this is Seehofer’s provincial concern. Seehofer appears not to grasp—or care—that his Merkel-bashing plays straight into the hands of not just one but several ignominious currents on the march in Europe today. There are three potent forces of illiberal politics that are currently battling for Europe’s soul, seeking to tear down the open society—and the unlikely bedfellows are working on it hand in hand. The first is Europe’s far right, which desires a Europe of more or less homogenous nations. Second is Putin’s Russia, which believes that it will gain from a dysfunctional or nonexistent EU—a divided, quarreling Europe of nations that it could outmaneuver in terms of power politics and use to justify an authoritarian, aggressive Russia. And the third is Islamist fundamentalism, which wants Europe’s Muslims on its side, and a Europe itself unable or unwilling to intervene effectively outside of Europe. As different as they are, all three of these currents intersected on Berlin’s Breitscheidplatz on December 19. The Islamic State attack was certainly planned and perpetrated to strike Merkel, Europe’s strongest-willed liberal; it was an attempt to damage her credibility in election year 2017 and boost the Islamophobic far right, the jihadists’ best recruiter. Moscow was surely brimming with Schadenfreude, gleeful that the EU’s order and its de facto leader were dealt a terrible blow, one that (as RT dutifully reports) would help its many friends among Europe’s far right and tax Germany’s relations with its Muslim population. The pre-Christmas bloodshed was an attempt to meddle in Germany’s electoral politics, one carried out by Islamists and deftly manipulated by the far right and Putin. It’s overblown to call Merkel the new leader of the free world in the age of Trump. But she’s the most solid pillar of what were once Atlantic values in Europe, for better and for worse. The alternative is a return to the ethnic nationalism of the past. And this is why a handful of my left-wing friends in Germany tell me they’ll consider casting their vote for Merkel in autumn 2017. Their biggest qualm is not so much voting Christian Democratic for the first time in their lives, but rather that with Merkel comes Seehofer and the CSU.